Like other states with significant rural populations, local communities in Indiana have been working to come up with ways to improve connectivity for residents and businesses. Two more areas in Indiana can expect better connectivity as county government invests for economic development and a rural electric co-op decides its time to offer Internet access to members. In the south central section of the state, Jackson County Rural Electric Membership Corporation (REMC) serves members in ten counties. Their members don’t live in areas in and around the larger towns in the region because most of those premises already had electric service when REMC obtained a federal loan to electrify the area in 1937. Their service area covers about 1,400 square miles and they serve 24,200 members. Several factors were taken into consideration: enhancing the quality of life for members, agricultural and agribusiness needs, providing an enhanced path for education and healthcare opportunities, keeping our communities economically viable, and developing a plan where no REMC member is eft out. All of these facts fall under Cooperative Principle #7: Concern for Community. REMC will invest approximately $5.43 million for the project’s first phase; the entire project will cost $20 million in Jackson County alone. The investment for REMC’s entire service area will be $60 million. Co-op officials estimate the project will be cash positive in three years and will be completely paid for in 16 years. In June, Jackson County Council unanimously approved a tax abatement for the cost of phase 1, which establishes the backbone for the system and snakes through most of the counties in REMC’s service area. Phase 1 will also include an opportunity to test the network by connecting approximately 990 members in order to work out problems before offering services to members across the entire network. According to the local Crothersville Times, local realtors have expressed concern about the county’s lack of high-quality connectivity, said Executive Director of Jackson County Industrial Development Corporation Jim Plump. “I would point out that Jackson County REMC serves customers in 10 counties in southern Indiana and the total investment in this project over the next five years will top $60 million throughout the service territory,” Plump said. “Less than 6% of Jackson county REMC members have access to what the FCC defines as minimum download speeds,” he noted. REMC plans to start phase 1 construction August 1st with completion date expected about one year later. This past session, the State Legislature passed SB 478, which will help streamline the process as REMC deploys a FTTH network to members. The bill, also known as the Facilitating Internet Broadband Rural Expansion (FIBRE) Act, allows electric cooperatives to rely on existing easements for electric lines to use those easements for fiber infrastructure. “Depending on the company, there are a lot of businesses who have maybe looked at moving into this area, locating here, or building new facilities in the past that have passed over this area because the bandwidth that they want is not available,” said [Ryan] Coates. Coates is from Maplenet Wireless, a local provider that is working with Elkhart County to install a stretch of fiber for connecting businesses along County Road 6 where they hope to draw commercial investment. About 83,000 people in Elkhart County live in the northern area near the cities of Goshen and Elkhart but the fiber optic project is located on the county's rural southern border. The county will own the infrastructure. As we’ve noted before, rural cooperatives and local government, such as municipalities and counties, are tired of waiting for big national telecommunications companies who don't seem interested in serving low denity areas. They understand that high-quality connectivity is now an essential service for business, education, government, and the quality of life that keeps families in their communities. Rather than watch rural towns dry up and disappear, local leaders and cooperative members are taking the initiative and making investments in Internet network infrastructure. For more on rural connectivity and rural cooperatives, catch Christopher's keynote address at the recent Appalachian Ohio-West Virginia Connectivity Summit. 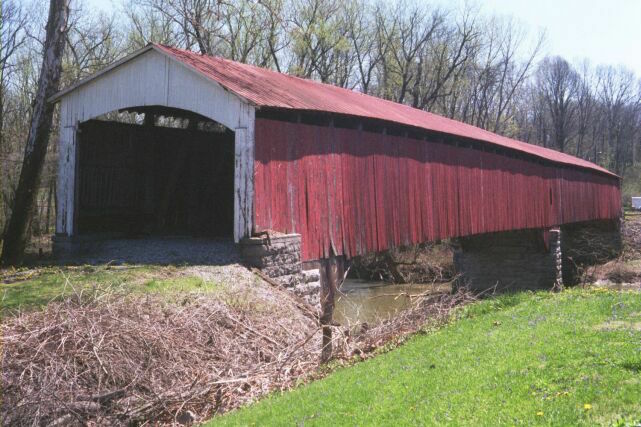 Image of the Shieldstown Covered Bridge in Jackson County, Indiana, by Chris Light (Own work) [CC BY-SA 4.0], via Wikimedia Commons. Our customers, when communicating with each other will get not 1 or 2mbs, but we will open up the pipe to them and they will have 100mbs at their disposal. Actually, I often say with tongue firmly planted in cheek that I hope that the other 49 states do outlaw what we are doing. Then I will ask them to send their technology companies to Lafayette where we will welcome them with open arms and a big pot of gumbo.